Ask a guest staying at San Diego’s Westgate Hotel to describe the Chief Concierge and there is a good chance he or she will mention the word “colorful.” Not only is Shraddha Carlin’s personality as bright as a rainbow on a sunny day, this 11-year concierge veteran works behind her Louis VI desk wearing silky Saris that scream one-of-a-kind style. “The Westgate receives guests from around the world. I was born in Zambia, and my first Westgate General Manager encouraged me to wear clothing representative of my native country. I now own over 100 saris, and wearing colorful clothing has sort of become my trademark,” Carlin said. Another attribute Carlin takes great pride in is keeping her Westgate guests happy. Carlin is a Hospitality, Sales, and Marketing International Award winner for service excellence. Whether she is arranging for a rental car, diagramming directions to a downtown restaurant, or reserving tickets for a concert, Carlin is always smiling, professional, and looking good. In a hotel lobby environment which is accented with Baccarat crystal chandeliers, a Steinway piano, and lavish Persian rugs, Carlin’s distinctive over-the-shoulder saris still stand out. For your next San Diego hotel stay, the city’s best dressed concierge believes you’ll be sorry if you don’t come see her saris … and experience her personalized service. It’s great to know a local knowledgeable and Professional Concierge with exclusive access to any and All activities and at the same time represents an European Historic Luxury Hotel which is The Westgate Hotel located in the heart of the Gaslamp Quarter-downtown San Diego, CA. We had the pleasure of meeting Sharddha on a recent visit to Westgate. She was so accommodating and personable! 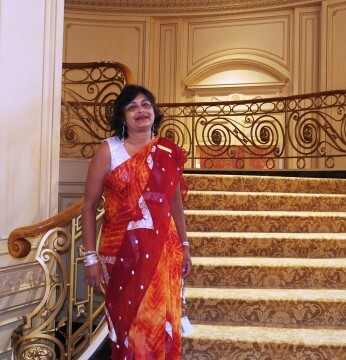 If you want to be treated like royalty, make sure and see her and her colorful saris on your next visit to the beautiful Westgate Hotel in San Diego. Sharddha is AMAZING! She always helps out with information of places to go and things to see. She is one the best! I know I can always come to her if I ever have any questions about what is going on in the area. Thank you Sharddha! To follow by the article, it is really true Shraddha is one of the most colorful, bright and shining person I know, she always gives you as a guest of the Westgate the feeling of beeing special and your needs are really important to her. From my perspective it would be so necessary that she passes on her passion and style to other concierges in the area of SD or even better all over the US, cause in current times most concierge think it is enough to be fast with googling things up, but this is the difference of the Shraddha service, all partners and offers are known personally and are even tested by her, you really feel the difference. So do not miss your chance and stop by at SD’s best concierge. Warren G. Bennis once said “Good leaders make people feel that they’re at the very heart of things, not at the periphery. Everyone feels that he or she makes a difference to the success of the organization. When that happens people feel centered and that gives their work meaning.” She has great leadership skills along with her beautiful smile that brightens up the whole room. Well-done and thanks for all your services! We recently visited The Westgate Hotel in downtown San Diego. Although, we live in the El Cerrito neighborhood of San Diego, we thought it would be more enjoyable to stay the weekend after enjoying a show at the SD Civic Theater instead of rushing to the city, looking for parking, gulping down dinner, seeing the show, fighting the crowd and traffic afterwards and then going home. How right we were on all counts! But the best part was staying at the elegant Westgate with it’s magnificent decor, great rooms, comfortable amenities, wonderful dining and superb staff. From the gourmet Broadway dinner to a white port night-cap at the pub accompanied by a mellow jazz quartet to the scrumtious breakfast on Sunday morning, we thoroughly enjoyed ourselves. But one of the highlights of our trip was meeting and then utilizing the expert services of the Westgate concierge. Schraddah Carlin knows San Diego. She advised us about the best restaurants, most lucrative shopping and special events happening in San Diego. She gave us a tour of the hotel, showing us the new pool and spa as well as the other new and improved facilities there. She guided us into the restaurants and introduced us to the servers, maitr’d and other staff members we happened to see. In other words, she went above and beyond to assist and please her clientele. The next time you desire to visit The Westgate Hotel, seek out Schraddah after you make your reservations and she will help you plan a successful and enjoyable trip. We recently stayed at The Westgate Hotel in San Diego and thoroughly enjoyed our visit. What helped to make our trip more memorable was the staff and srvices at the hotel. In addition to the bellmen, valets, maids, servers, receptionists there was one employee, in particular, that contributed to our satisfaction. That person was Ms. Schraddha Carlin, the hotel concierge. Her knowledge of local retaurants, things to do and shopping were unsurpassed. We hope you can write about her expertise and efficiency. Our family has not experienced the services of The Westgate Hotel but have taken advantage of Shradha Carlin’s services. A relative of ours was visiting San Diego from Africa and needed a guide for places to visit. We were referred to Shradha through someone who had experienced her services and were not disappointed. She went out of her way to make sure they had a very enjoyable and trouble free stay in San Diego. It’s been over a year since the visit and our relatives still talk about “the best vacation” they had and will be etched in their memory forever. Thank You Shradha . Shraddha is as beautiful as her many saris, both inside and out. She is knowledgeable, friendly, and always positive. She enjoys her job and it shows. Her recommendations are always excellent. Shraddha is one of the most knowledgable, professional and caring people in the service industry that I ever came across. She goes extra mile for each and every guest, as they would be a part of her family. I had an honor to know Shraddha for many years now and I don’t know anyone who receives as much positive feedback from their guests as she is. My friends who stayed at Westgate were blown away by her hospitality. Truly genuine sweet person and amazing concierge! Simply the best. It’s first class service all the way when you step into the lobby of the San Diego Westgate Hotel. and who better to make you feel welcome but Shraddha Carlin the remarkable concierge to give you all the going ons in San Diego. It is elligance combined with sophistication she provides. She been pictured with President Bill Clinton, Dali Lama and other high profile people requiring her attention. Experience her and Wedtgate yourself and know why this is a true gem of San Diego! and it seems incomplete when she is not there…. For Best Concierge service at Westgate Hotel you must see Shraddha Carlin . She excels at customer service and truly goes out of her way to enure all the needs are taken care off. She has taken care an coordinated all my needs from getting tickets to the theaters, selecting restraunt to satisfy my special diets and making dinner reservations, arranging wine tours and golf. She has a great cheerful personality ! She always makes my trips delightful. It is a total joy working with Shraddha! She has a natural and effortless gift of hospitality and never ever fails to make each and every one of our guests feel at home. She goes above and beyond what is expected for guests and co-workers alike. There is not a day that goes by where I don’t see Shraddha laughing and having a wonderful time with our guests. Thank you Shraddha for your contribution to the excellent guest service at The Westgate Hotel. We love you! Shraddha is nothing short of fantastic! She exudes both joy and class as she embraces her guests and guides them to their next adventure. Every encounter with Shraddha begins with a smile, and she never fails to help create amazing memories and experiences for those visiting San Diego. The Westgate Hotel is absolutely lucky to have her! The hotel is beautiful, but Shraddha, the Chief Concierge is the star that makes the hotel really shine! She always goes above and beyond, with her wealth of knowledge and guest service, all delivered with such style and a beautiful smile in a genuine warm and friendly manner. When I think of service delivered with heart, I think of Shraddha! Shraddha is the Westgate hotel. I’m surprised she isn’t compleatly running the place by now. I’ve traveled all over the world, stayed in the finest hotels and Shradda is BY FAR one of the best around. She holds the keys to the city and is a true asset. As an officer and meeting planner for our National Association, I always choose the Westgate Hotel when planning our Executive Group Meeting in San Diego. Our group consists of well traveled Senior Executives of major companies and the Westgate truly knows how to accommodate our group. From the wonderful cocktail parties to the hosted dinners and luncheons in the most proper venues of the hotel. A meeting at the hotel is not complete without my interaction with Shraddha who is a knowledegable, professional and charming Concierge. Shraddha certainly knows the San Diego venues and she works closely with me to make sure that every detail is covered in arranging transportation, restaurant reservations and entertainment which would suit this group of Exectives. Shraddha is truly an asset to the Westgate and a contribution to the success of this welcoming hotel. To me, Shraddha make The Westgate, THE Westgate. I can remember her perfectly form the first time I visited the hotel for Sunday Brunch. She said hello to everyone in the Dining Room. By far, one of the most eloquent, graceful and charming individuals I have ever met and no visit to this hotel is complete until you get a chance to say hello to this amazing woman! Every time I come to visit, Shraddha is the first to greet and welcome me which gives me a warm feeling and a sense of family there. She is very detail oriented and really goes above and beyond to make things happen for her guests. A very special and unique Concierge indeed, the type you definitely utilize and are familiar with n a high end property on the East Coast. Kudos, Shraddha! A well deserved article! I’ve been working with Shraddha for almost five years and I lost count of how many positive guest comments the Westgate Hotel receives as a result of the excellent service she provides. Thank you for letting your extensive and solid knowledge as Chief Concierge reach every guest that stays with us! I can always count on Shraddha to coordinate all our activities with great interest, coordinating new and exciting activities that are perfect for us. Shraddha is very professional and takes care of us with such warmth in finding us the best activities in town. From fine restaurants to dine at, transportation to printing out our directions and itineraries. It is always a wonderful experience working with her accommodating and helpful attitude. When staying at the Westgate Hotel in San Diego, I highly recommend not missing the opportunity of having a fantastic vacation rather than an ordinary vacation by having Shraddha help you plan all your activities and arrangingeverything for you. Shraddha knows her way to the city like no one else, she knows the perfect spots and places to go out. Every time you go to the Hotel she makes you feel welcome with the sensation you are back home. She arranges all your travel needs with a smile, she is eager to help in any way she can. Thank You Shraddha for the wonderful job that you do. It is my pleasure and joy each day I work to see the level of customer service provided by Shraddha. She has hospitality embedded in her soul and knows San Diego’s little secrets like no one else. She’s the ultimate concierge package! I have enjoyed staying at the Westgate for both business and leisure. Shraddha has been the consistent and professional face of the hotel. The only thing that rivals Shraddha’s impeccable style is her attention to detail and customer satisfaction. Many concierges possess a deep level of knowledge about certain aspects of San Diego while many others maintain a broad familiarity with the city in general. It is Shraddha’s depth and breadth of knowledge about her city that truly sets her apart from her competition. It is the passion with which she imparts these gems of knowledge to her guests that creates an unforgettable Westgate experience. At a recent stay at The Westgate, I had the pleasure of meeting Shraddha. She went beyond my expectations and helped coordinate a wonderful vacation for my family. I have been working with Shraddha for a couple of years and she has been so much fun to work with! She never fails to plan your trip or stay-cation due to her eagerness to help. She knows everything about anything in the big SD!! I have been working with Shraddha for about 5 years. She is one of a kind concierge in the Gaslamp. She is knows the all San Diego area very well and her professionalism and enthusiasm for her job is very inspiring. If you need any assistance where to go, what to do in San Diego, Shraddha will surely find something unique for your needs. I met Shraddha 10 years ago through the San Diego Concierge Association. Over the last year, she has served on the Association’s board as Madam Secretary. One would only need to Google her name. The incredible comments that she constantly receives for her dedication and commitment to excellence as the Chef Concierge at the Westgate Hotel will be available for you to read on the many different social networking websites. She is a “shining star” within the San Diego Hotel Industry and the San Diego Concierge Community. Over the years, Shraddha and I have become very close friends. She is one of my most cherished gifts and I am honored to call her my colleague and friend. It’s a pleasure working with Shraddha at The Westgate Hotel. She excels at customer service, being knowledgeable, professional and always ready to go above and beyond for our guests. Thanks for taking such good care of our guests and for being a shining star in our team! 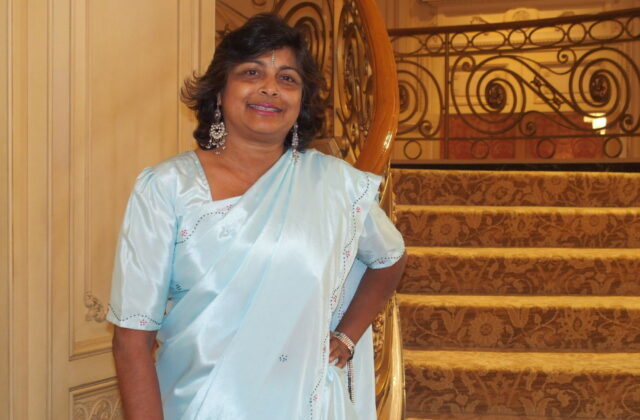 Besides being a stellar concierge, Shradda is a lovely, gracious person with a huge heart. I am both fortunate & proud to be a colleague of hers. Shraddha is a very pleasant, professional and friendly person. She has good knowledge about her job and very provide high level of customer service. I found her very lovely person and admire her the way she promotes her culture and she looks very graceful. Shraddha is a wonderful ambassedor for the Westgate Hotel and the city of San Diego. She loves her guests, her hotel and her city. I have been fortunate enough to be a business partner with Shraddha many times this year and truly appreciate the support she has offered in the busy Downtown area. She is a gem of the Westgate and always strives to keep her guests satisfied. Many thanks are due to her for being such an advocate for me and my business! Everyone in the industry knows that Shraddha is “the best”. She goes the extra mile to help her guests and most become friends before their stay at the Westgate is over. She is a striking figure in her beautiful saris..